[Charles Ouweland] purchased some parts off Aliexpress and noticed that the Texas Instruments logo on some of his parts wasn’t the Texas Instruments logo at all, it was just some kind of abstract shape that vaguely resembled the logo. Suspicious and a little curious, he decided to take a closer look at the MCP1702 3.3v LDO regulators he ordered as well. Testing revealed that they were counterfeits with poor performance. Looking at the packages, there were some superficial differences in the markings of the counterfeit MCP1702 versus genuine parts from Microchip, but nothing obviously out of place. To conclusively test the devices, [Charles] referred to Microchip’s datasheet. It stated that the dropout voltage of the part should be measured by having the regulator supply the maximum rated 250 mA in short pulses to avoid any complications from the part heating up. After setting up an appropriate test circuit with a 555 timer to generate the pulses for low duty cycle activation, [Charles] discovered that the counterfeit parts did not meet Microchip specifications. While the suspect unit did output 3.3 V, the output oscillated badly after activation and the dropout voltage was 1.2 V, considerably higher than the typical dropout voltage of 525 mV for the part, and higher even than the maximum of 725 mV. His conclusion? The parts would be usable in the right conditions, but they were clearly fakes. The usual recourse when one has received counterfeit parts is to dump them into the parts bin (or the trash) and perhaps strive to be less unlucky in the future, but [Charles] decided to submit a refund request and to his mild surprise, Aliexpress swiftly approved a refund for the substandard parts. While a refund is appropriate, [Charles] seems to interpret the swift refund as a sort of admission of guilt on the part of the reseller. Is getting a refund for counterfeit parts a best-case outcome, evidence of wrongdoing, or simply an indication that low value refund requests get more easily approved? You be the judge of that, but if nothing else, [Charles] reminds us that fake parts may be useful for something perhaps unexpected: a refund. We all know the old saw: if it’s too good to be true, it probably is. But nowhere does this rule seem to break down as regularly as when we order parts. Banggood, AliExpress, and eBay are flooded with parts ready to be magically transported across the globe to our doorsteps, all at prices that seem to defy the laws of economics. Most of these transactions go off without a hitch and we get exactly what we need to complete our Next Cool Thing. But it’s not always so smooth, as [Kerry Wong] recently discovered with an eBay order that resulted in some suspicious chips. [Kerry] ordered the AD633 analog multiplier chips as a follow-up to his recent Lorenz Attractor X-Y recorder project, where he used an Arduino to generate the chaotic butterfly’s data set as a demo for the vintage instrument. Challenged in the comments to do it again in analog, [Kerry] did his homework and found a circuit to make it happen. The needed multipliers were $10 a pop on DigiKey, so he sourced cheaper chips from eBay. The $2 chips seemed legit, with the Analog Devices logo and everything, but the circuit didn’t work. [Kerry]’s diagnosis in the video below is interesting, and it’s clear that the chips are fakes. Caveat emptor. Here’s hoping that [Kerry] sources good chips soon and regales us with a successful build. Until then, what are your experiences with cheap chips? Have you been burned by overseas or domestic suppliers before? Does any single supplier seem like a better bet to you, or is it all hit or miss? Sound off in the comments below. A new single-board computer by Orange Pi has popped up for sale on AliExpress. The Orange Pi 2G-IoT is designed to compete with the Raspberry Pi Zero, and if specs are anything to go by they have done a nice job. There are a lot of options for extra small single board computers these days and there’s a growing list at the lowest price points. Let’s call it the sub-$20 cost range (to quell the argument of shipping fees). 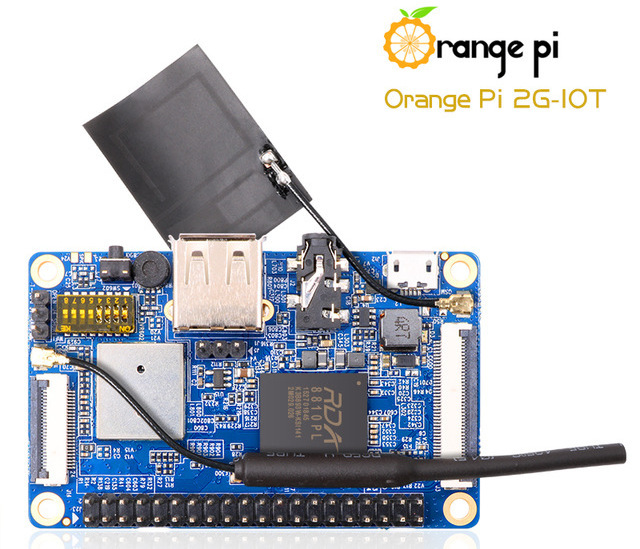 We have seen C.H.I.P., the Raspberry Pi Foundation released the Pi Zero W (an update to the Zero line that included WiFi and Bluetooth), the already available Orange Pi Zero (which was featured in a project on Monday), and now add to that list the unfortunately named Orange Pi 2G-IoT. The 2g-IoT is sporting an ARM Cortex-A5 32bit clocked at 1GHz with 256MB DDR2 RAM. It’s nice to see 500 MB of on-board NAND to go along with an SD card slot for larger storage. It also has a CSI camera connector, WiFi, Bluetooth, an FM Radio and GSM/GPRS with a sim card slot on the bottom. It is pin compatible with Raspberry Pi’s almost standardized GPIO layout. All this for $10 is quite impressive to say the least, especially the addition of GSM/GPRS. Will it kill Raspberry Pi Zero W sales? We think not. While the Orange Pi’s are great little computers, they don’t have the community support that is afforded to Raspberry Pi products making for less support online when you run into a problem. That’s if you can even get the thing running in the first place. The Orange Pi’s website has not yet been updated to reflect the new release. However if you are interested in getting one for yourself right now, head over to your favorite Chinese electronics supplier. Cx5 is a strange material that’s a favorite of model makers and prop replicators. It’s kind of like a wax, kind of like a clay, and a little bit like a plastic. Now it’s a 3D printer filament. It looks very interesting for sculpted and highly detailed models, something the 3D printing scene hasn’t had yet. So you want a CNC machine, right? Tormach makes a good one, and here’s what it takes to put a PCNC440 in your garage. This is an incredible amount of work and a great excuse to buy an engine hoist. [Zemnmez] could find dozens of apps and webpages that would calculate resistor color codes for him automatically. What he couldn’t find is one that would do it in reverse – i.e. type in a resistor value and return the correct color code. He made this. AliExpress always has some interesting stuff on it, and [Ethan] found something very cool. They’re A8 CPUs found in the latest iPhone. Are they real? Who knows. I bought one, and you’re going to get pictures in another links post in a month or so. The Game Boy Micro was released by Nintendo in 2005 and quickly became one of the coolest and most desired handheld consoles on the planet. You need only look at the eBay listings for the Micro as evidence of its desirability. [ModPurist] took an old DS Lite and converted it into a Game Boy Micro – same idea, larger package.